Gymnosporangium rusts have been active in many parts of the state for a few weeks. 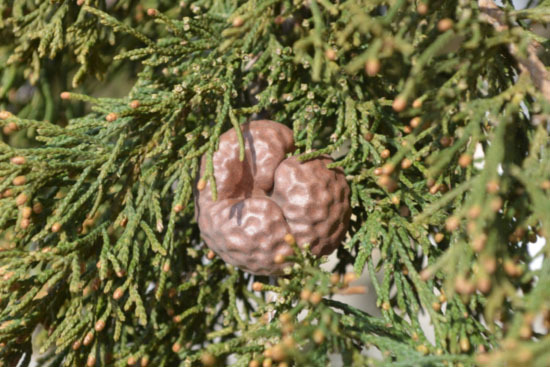 This past weekend, I observed several eastern red cedar trees in the Chicagoland area loaded with sporulating rust galls. This stage of the disease causes minimal damage to the evergreen host. However, the spores produced on these galls will infect nearby apples, crabapple, and hawthorns where injury is much more noticeable. Three Gymnosporangium rusts commonly affect trees in Illinois landscapes: Cedar-apple rust, Cedar-hawthorn rust, and Cedar-quince rust. As their name suggests, these pathogens require two hosts to complete their life cycles. A portion of each disease's life cycle occurs on Juniper (Juniperus spp.) hosts, while the remainder occurs on one of several deciduous host within the Rosacea family. These rust pathogens overwinter Eastern red cedar and other Juniperus spp. as hard and pitted galls or spindle shaped swellings on young branches. Galls are light brown to reddish or chocolate brown and range from 1/8 inch to 2 inches in diameter (Image 1). Galls formed on evergreen hosts are not usually damaging, but serve as an important stage in each pathogen's life cycle. Over the past few weeks, telial sporehorns have emerged from overwintering galls. The sporehorns have a distinct, orange, gelatinous appearance (Image 2). Sporehorns swell when moisture is present, then discharge spores as the dry. Discharged spores can be carried several miles by wind, but mostly infect susceptible trees within several hundred feet. Sporehorns exhaust all their spores approximately 30 days after apples and crabapples have bloomed. Image 1. 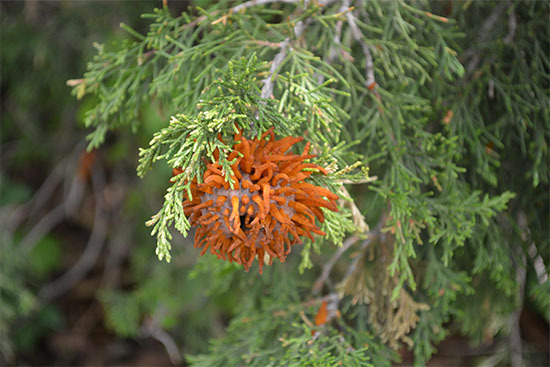 Over-wintering Cedar-apple rust gall on Eastern red cedar. Feb. 2014. Image 2. Gelatinous telial horns on Eastern red cedar. May 2018. Apples, crabapples, hawthorns and quince are some of the more commonly affected deciduous species. They are also the hosts we are most concerned about when apply controls. Infections to deciduous hosts occur the spring as beginning as apples and crabapples are in their pink-bud to early bloom stage. This timeframe coincides with the development of sporehorns on Juniperus spp. 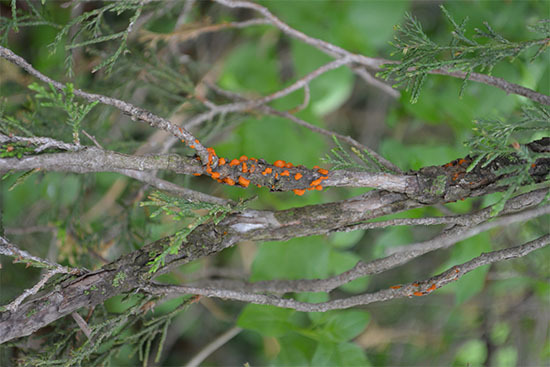 Cedar-apple rust and Cedar-hawthorn rust causes mostly aesthetic injury in the form of pale yellow to orange leaf spots often with a reddish border. Severe infection may result moderate defoliation, especially during dry summers. Cedar-quince rust can be quite damaging to hawthorn, causing deformed swellings, galls, infected fruit, and stem tip dieback. Image 3. Telial stage of cedar quince rust on Eastern red cedar. May 2018. The most common control strategies for Gymnosporangium rusts in the landscape focus on protecting the deciduous hosts. These recommendations start with utilizing resistant or immune species and varieties. Though not always practical or feasible, infections to broad-leaved host can be reduced by removing unwanted host trees within a ½ mile radius. Overwintering galls can also be hand-picked or pruned from small junipers during the fall and winter months. Fungicide sprays are effective at protecting susceptible trees from infection, but are rarely utilized on Juniper hosts. Fungicides are applied to deciduous hosts beginning at the pink-bud stage, with re-applications at labeled intervals until 1-2 weeks after petal fall. It is too late to begin protective spray for this year's foliage. However, you can make note of susceptible trees, and treat those at the appropriate time next spring. Fungicide options are listed in the Commercial Landscape & Turfgrass Pest Management Handbook and the Pest Management for the Home Landscape.